Illinois pulled off a crazy upset over Michigan St. this week, and Iowa’s Jordan Bohannon hit a crazy buzzer-beater in a win over Northwestern to lead the story-lines of the week. Let’s get into the games! Penn State’s 18 points from Lamar Stevens and 14 points from Rasir Bolton off the bench was enough for Penn State to pick up their first conference win. Penn State shot just 38 percent, but limited Northwestern to just 32 percent. Derek Pardon had 18 points and 10 rebounds and Vic Law had 10 points and 10 rebounds for Northwestern. Ignas Brazdeikis led Michigan with 23 points as the Wolverines were able to pick up a road win at Rutgers. Jon Teske and Jordan Poole combined for 22 points but shot a poor 8-for-23 together. Eugene Omoruyi had 21 points and Montez Mathis had 12 points for Rutgers. Illinois pulled the upset of the week with a big home win over Michigan State. Ayo Dosunmu had 24 points, Giorgi Bezhanishvilli had 16, and Trent Frazier had 15 for the winners. Cassius Winston had another big night for Michigan St., finishing with 21 points and nine assists. Ethan Happ had a 15 point, 13 rebound double-double to lead Wisconsin to a road victory over Minnesota. Brad Davidson added 10 points, and Nate Reuvers had nine rebounds and seven blocks for Wisconsin. Jordan Murphy had a huge 16 point, 19 rebound performance for the losers. Jalen Smith and Bruno Fernando both had double-doubles to power Maryland past Nebraska. Maryland shot the ball 38 percent, but held Nebraska to an extremely poor 21 percent, including 0-for-10 shooting from Glynn Watson Jr. for Nebraska. Isaiah Roby 20 points and 1 rebounds to lead the Cornhuskers. Jordan Bohannon and Tyler Cook combined for 46 points for Iowa in their win over Indiana. Iowa made 10 threes and 13 free-throws on the night. Romeo Langford had 22 points and five rebounds for Indiana, and Juwan Morgan added 17. Ohio State’s 50 percent shooting helped power them to a win over the feisty Penn State Nittany Lions. Luther Muhammad had 20 points, and Andre Wesson had 15 points and 10 boards for the Buckeyes. Lamar Stevens and Josh Reaves each had 20 for Penn State,. Charles Matthews had 18 points, and Jon Teske had 17 points and 12 rebounds to lead the Wolverines over the Badgers. Michigan shot 45 percent while limiting themselves to just five turnovers. Ethan Happ had 18 points and 11 rebounds to pace Wisconsin. 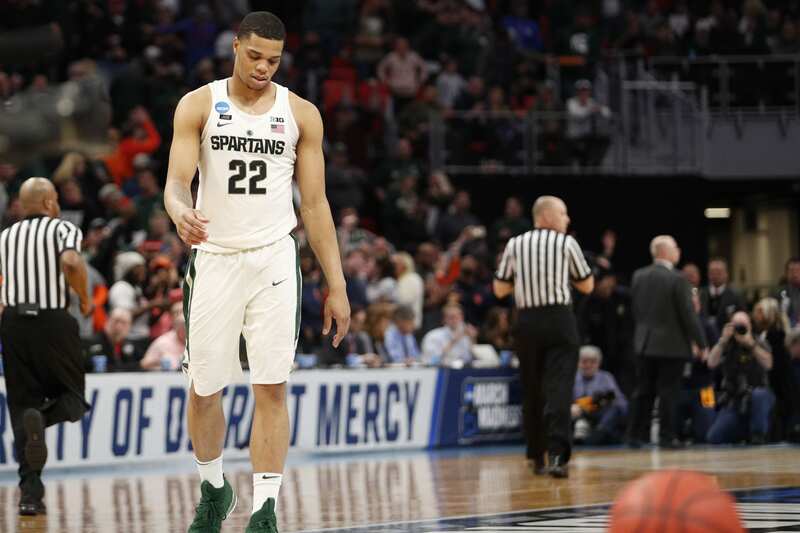 Michigan State finally broke out of their three game losing streak with a blowout win over the sliding Minnesota Golden Gophers. nick Ward had 22 points and nine rebounds and Cassius Winston had 11 points and nine assists. Matt McQuaid added 18 points, and eight more assists, as Michigan State thrives off the catch-and-shoot. Gabe Kalscheur had 17 points for Minnesota. Carsen Edwards dropped 27 points as Purdue blew out Nebraska at home. Grady Eifert had 16 points, and Nojel Eastern had 12 points and 10 rebounds. Thomas Allen led Nebraska with 18 points off the bench, and Nebraska shot just 38 percent on the night. Giorgi Bezhanishvilli exploded for 35 points, as Illinois took down Rutgers at home in overtime. Four total players would reach double figures for Illinois, who shot the ball 50 percent. Caleb McConnell had a big night for Rutgers with 25 points and nine rebounds off the bench. Iowa was down 15 points with 4:30 left, but Iowa fought back and won the game thanks to a Jordan Bohannon buzzer-beater. He had 15 points, but Joe Wieskamp led with 21 points while Tyler cook had 19 points and 11 rebounds. Vic Law led Northwestern with 24 points and 10 boards. Indiana couldn’t convert in the final seconds to send the game into overtime, as Ohio State snuck away from Bloomington with a 55-52 win. The Wesson brothers combined for 25 of Ohio State’s 55 points, as the team shot 44 percent. Romeo Langford had 15 points for Indiana, while Juwan Morgan was held in-check with just three points, but still managed to haul-in 14 boards.